Senator of the Federal republic of Nigeria and a one time senate leader. He is a senator of the Federal Republic of Nigeria, and an Ex-Governor. He is an indigene of Kwara State. He is married to Toyin (née Ojora) Saraki. They are blessed with four children. He is a member of the All Progressives Congress (APC); haven previously defected from the People's Democratic Party (PDP). Bukola Saraki’s major landmark achievement was in Agriculture. He introduced a range of reforms to agricultural policy to increase the commercial viability of farming, and to increase exports to international markets. The New Nigerian Farmers Initiative was designed to improve the technical capability of farmers and to ensure farmers had a significant financial stake in new investment in agriculture. The scheme utilised the under-used resource of agricultural expertise in the Zimbabwean farming industry, and worked with the Zimbabwe Commercial Farmers’ Union to identify high-skilled farmers able to support the State’s farming industry to move to Kwara and develop the industry. A commercial hub was also developed to build capacity support training of the indigenous farming community. One of the most widely recognised achievements of the Nigeria Governors’ Forum was its intervention over the problematic assumption of power by then Vice-President Goodluck Jonathan, following the illness and subsequent death of President Umaru Musa Yar'Adua. On 23 November 2009, President Yar’Adua left Nigeria and travelled to Saudi Arabia, where he was installed in the King Faisal Specialist Hospital and Research Centre in Jeddah for the treatment of what was reported to be acute pericarditis. He was not seen in public again and his absence created a dangerous power vacuum in Nigeria. The problem was that, for the Vice-President to succeed the President, the constitution demanded that the latter wrote a letter to the National Assembly making clear the appointment of the former. But as President Yar’Adua was constantly in and out of intensive care, this letter was never written and the succession therefore came into question. After his two-term tenure as Governor of Kwara State, in the 2011 elections, Bukola Saraki ran for the office of Senator of the Federal Republic of Nigeria representing the Kwara Central Senatorial District and won, succeeding his sister, Gbemisola Saraki-Forowa. He was appointed as the Chairman, Senate Committee on Environment and Ecology and is also a member of the Senate committee on capital Markets and Finance. He also pushed a motion in the Senate to end the fuel subsidy regime in Nigeria which has been an excessive waste of the country’s national resources. As a member of the Senate, Senator Saraki has campaigned extensively on health, food security, education and the environment. He was appointed as the Chairman, Senate Committee on Environment and Ecology and is also a member of the Senate Committees on Capital Markets and Finance. He also pushed a motion in the Senate to end the fuel subsidy regime in Nigeria, which has been an excessive waste of the country’s national resources. His work on the oil industry, has also led him to focus on arguing to strengthen laws relating to the clean up of oil spills. His National Oil Spill and Detection and Response Agency Amendment Bill seeks to ensure oil companies pay appropriate levels of compensation to communities affected by oil spills. 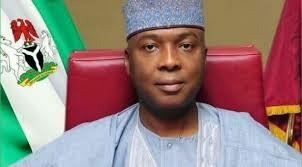 Bukola Saraki has received several awards and honours. He was the first serving Nigerian Governor to be awarded the National Honor of Commander of the Order of the Niger (CON) in 2010. He also received the award of ‘Governor of the Year’ by This Day Newspapers in 2004; ‘Best Governor of the Year in Agricultural Development in 2004/05’ by City People, KSNG; Leadership Award in appreciation of commitments and outstanding leadership qualities in 2005; Harvard Business School Africa Club Award in 2005; Kenneth Kaunda Foundation Best Governor in Africa in 2006; Osun State Broadcast Corporation Man of the Year in 2006; ‘African Governor of the Year in Agricultural Development’ by African Union Media Group in Pretoria, South Africa; Nigeria Referee Association Grand Patron 2007; This Day Newspaper Best Governor on Food Security 2008; ‘The Friend of Nigerian Youth; Doctor of Science and Public Administration Award’ by University of Port Harcourt for his Administration’s focus on Agriculture; Life Fellowship of All Nigeria Confederation of Principals of Secondary Schools, (ANCOPSS) 2009; Outstanding Governor on Energy 2009 by the Nigerian Compass; Emerging Tiger of Nigeria (Leadership Award by This Day Newspaper) 2010; Institute of Chartered Accountants Award of Excellence 2010; Nigerian Bar Association Award of Excellence; Award of Excellence in Development of Education and Health care delivery in Nigeria by the College of Medicine, University of Lagos 2012. Awesome article man! I am big fan of your blog now.